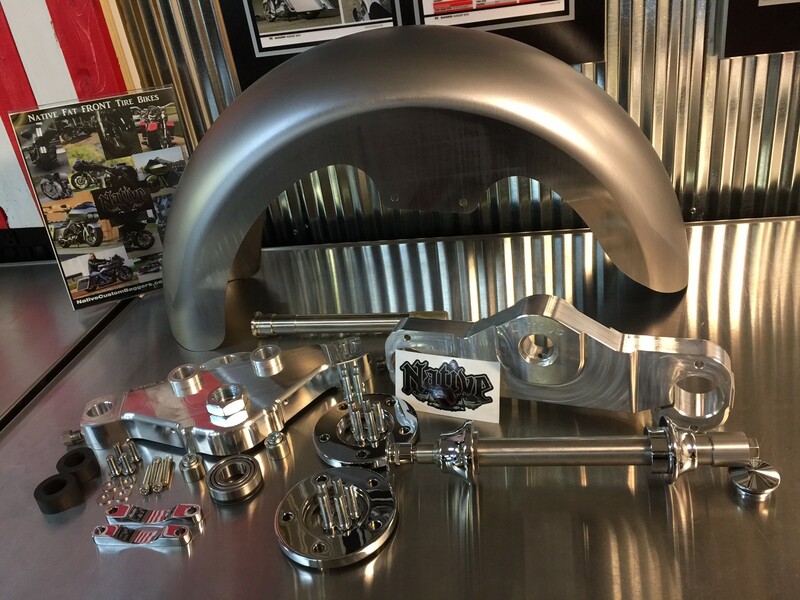 Native Customs includes the NECESSARY custom notched slider covers without any additional charge for chrome or black axel spacers. 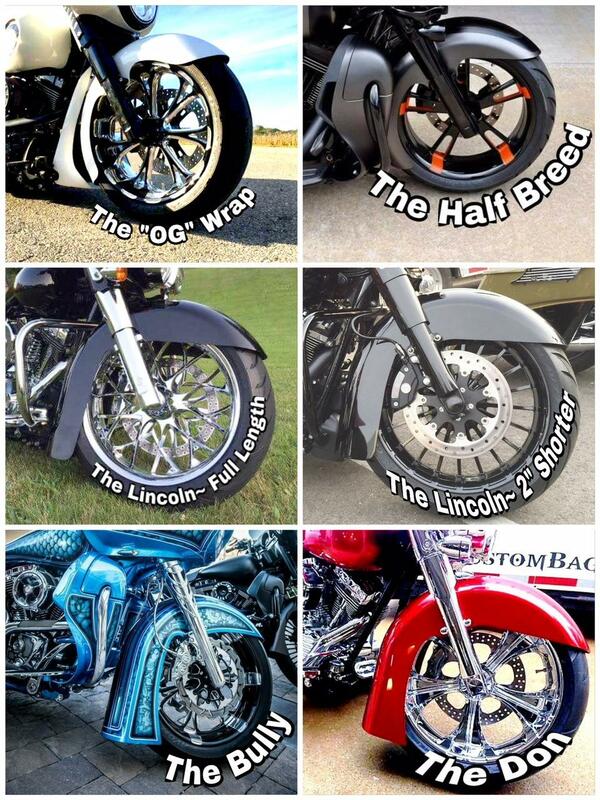 This is the most comprehensive wide front tire kit we offered by Native Customs. Pitbull PRO wide front tire kit allows you to run a 180mm (7.25") or 200mm (7.5") wide tire up FRONT and compliments a 180 or 200mm rear tire perfectly. This kit fits Road Glides, Road Kings and all batwing fairing models like Street Glides and Ultra Classics. Your fairing or nacelle will bolt up to your new Native Customs triple trees just like it did to the stock trees because while Native Customs triple trees do spread your forks farther apart, overall they are not any wider than stock trees. - Will provide a smoother ride than even a stock front end. - Will handle awesome, including in corners. - Will help protect your wheel from pothole damage. - Is a completely BOLT-ON kit that maintains stock front end rake. - Saves you money at the painter because the fender is such awesome quality. - Uses a very common size tire that is readily available around the country. - DOES NOT require special modified fork legs. - Offers you a choice of 5 different fender styles. - Native Customs brand AMERICAN MADE stamped steel laser cut original "OG" Wrap or "Halfbreed" Wrap style fender. - Special raw finish SLIDER COVERS which are VERY IMPORTANT and MUST be used with this kit. Chrome or gloss black powder-coat available as an option. - Special width chrome or black axle spacers are included at no extra charge. This hides your wheel bearings! - Special width machined finish fender spacers with chrome or gloss black available as an option. 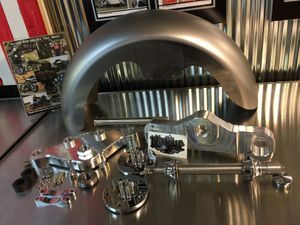 - Special width axle for stock HD, Arlen Ness or Performance Machine fork legs. - A wider look because the fork legs are spread apart more than stock. - The PRO fender is not notched like the EASY kit fender is. - PRO kit allows the use of a 200mm (7.5" wide) tire. You can choose from 5 different fender styles in the menus above.